I Deoki Nandan Fogla, Aged – 62 Years have been suffering from “High Grade B-Cell Non-Hodgkin Lymphomas (NHL). 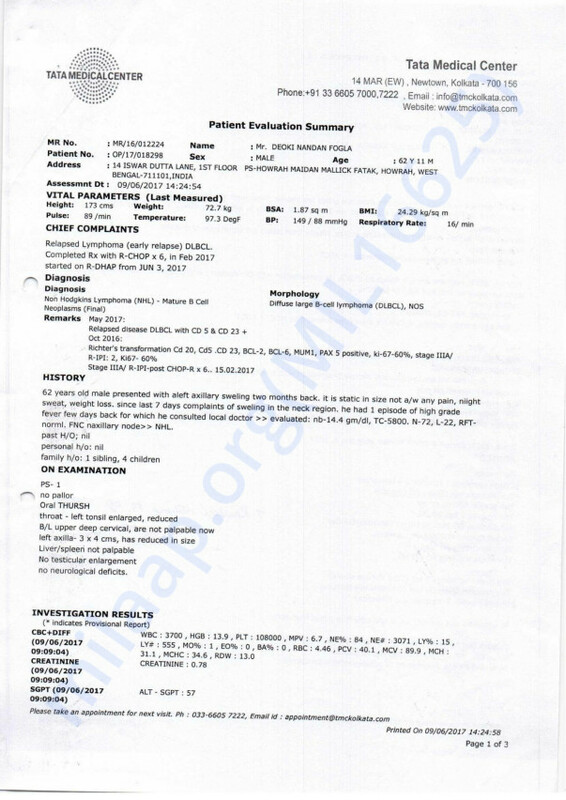 The disease was traced in the month of October 2016 and the treatment was started in TATA MEDICAL CENTER, Kolkata. Initially 6 cycle of Chemotherapy was given which comes to an end in the month of February 2017. Unfortunately the disease was relapsed in the month of May 2017. While on analysis by Medical team, it was informed that INTENSIVE CHEMOTHERAPY will be given and at the end of 3-4 cycles BONE MARROW TRANSPLANT need to be done. Due to my Medical issue from last Eight months, I have already spent all the savings. On 6th June 2017 I have received further estimate of Rs. 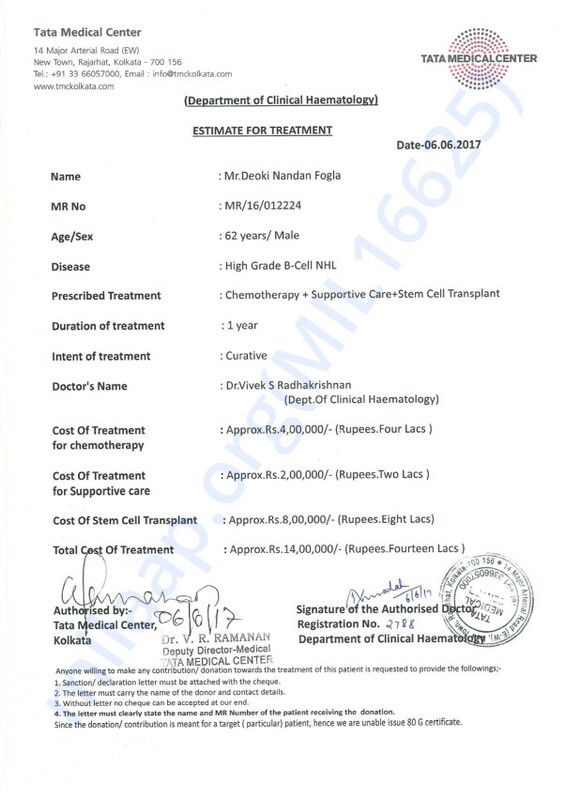 14,00,000/- (Rupees Fourteen Lacs) for its further treatment. 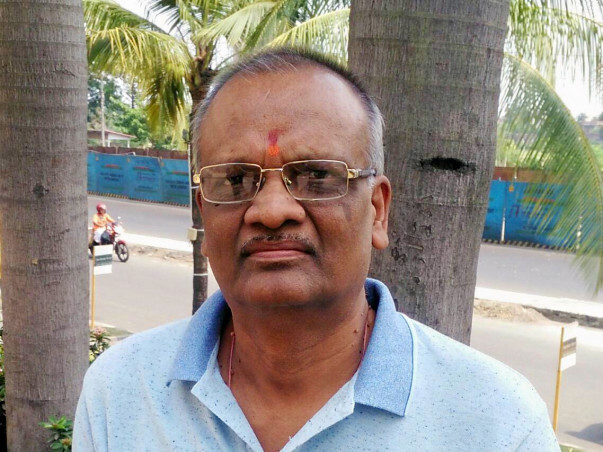 I request your esteem personality for being generous to the needy person, I request you to support me financially by sanctioning maximum possible fund towards treatment of this deadly disease. Hello friends. I want to share something with you all. There is a guy in my office and his name is Aditya Fogla (Son of Mr. Deoki Nandan Fogla) who is also an employee there. He seemed disturbed from quite a long time and after someday I came to know about the condition of his father who is suffering from High grade B-Cell Cancer. He seemed helpless both mentally and financially. The treatment requires around Rs.14,00,000 and its not possible for a middle level employee to bear such huge expense but still he is fighting. He even went to the Chairman of the company who is a billionaire, forget about 1400000, he didn't give a penny. Now, why i am saying all this is because he directly came to me asking for help and he believed i might get him some him some help in the month of Ramadan. I know how it feels to see your father on the hospital bed. I could relate and couldn't resist myself writing this message. He told me about his situation in Ramzan with the view that people would do charity but i couldn't pass on the message. He came to me yesterday again then i thought i must try at my end. I know its a huge amount but only if you can pass the message and forward it to those who help such people be it any trust or ngo. We all can contribute if we wish to. Something would be better than nothing. Bure waqt me insaan ko kuch samajh nahi aata..naa zaat..naa dharm bas ummeed rehti hai. Aur ummeed pe duniya qayam hai. I have decided to contribute something and i will urge you all to help. I am sending a letter along with the quoted hospital estimate. You can have a look at them. Main jo kar sakta hun woh kar raha hun..aap jo kar sakte hain aap woh karna. 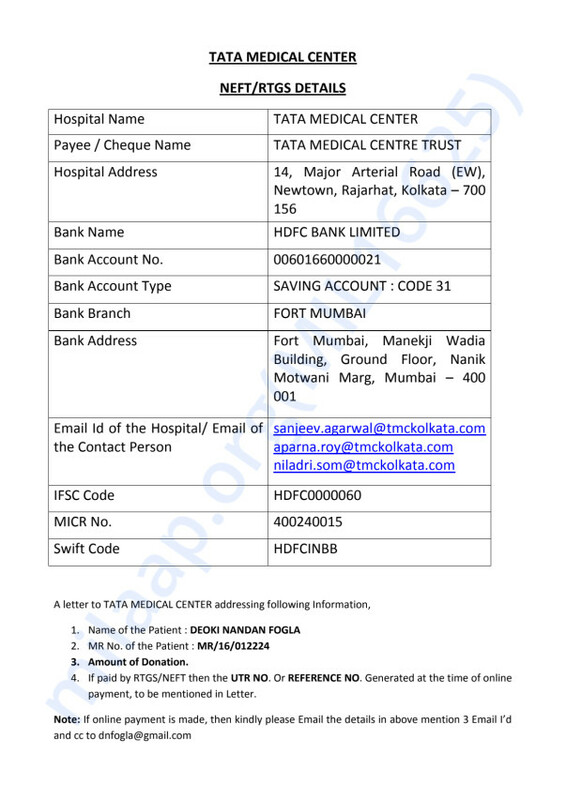 This is the total cost estimate given by the Tata Medical Centre .